What Is The Martingale Myth In Betting? Home The Martingale Myth: Truth About The Betting System That Work? The Martingale Myth: Truth About The Betting System That Work? The Martingale Myth, or the Martingale System, is a popular strategy in betting. This is used in a number of casino games, mostly with the aim to compensate the losses. The system is mainly favoured by those who love the roulette game. However, the reliability of the Martingale System has always been in question, and that is why many of the expert gamblers prefer to stay away from it. 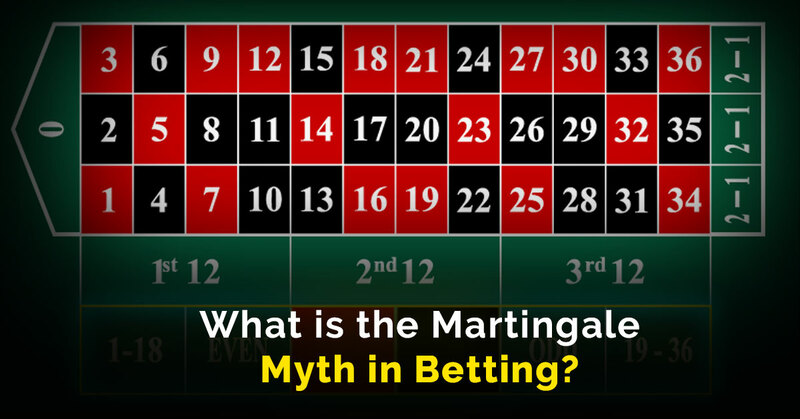 Continue reading to find out more about the Martingale Myth and its accountability in betting. If you have been reading gambling books or strategies, you would probably know that the Martingale System has been one of the most widely debated betting strategies in the history. There is a reason why it is also sometimes called just a myth. The history of this betting technique goes back to the 18th Century when it was developed in France for games with simple head/tail format. Soon after that, it was being used in casinos to limit the losses in games like blackjack and roulette which follow the similar pattern of 50/50 returns. Let’s find out how the system actually works in these particular casino games. Martingale system is used by many blackjack players to limit their losses in a game. This is how the system works in this particular game. According to the Martingale system rules, you should wager just the double of your previous losing stake. That means, if you bet $15 on the first hand and lose it, your next bet should be $30, and so on. You need to continue doing so until you win a hand. And when it happens, you will have recovered all your losses and make a profit of one unit as well. The one unit here refers to the size of the very first stake that you lost in a particular game. For example, if you bet $15 initially and lose it, and then bet $30 and lose that as well, your next bet should be $60 and the overall exposure is $105 (60+30+15). If you win this hand you’ll receive $120 (60+60) which would leave you with a profit of $15. As you can see, a single win can help you recover all your previous losses and even wins you a profit as well. But at the same time, the strategy requires you to double your bet with every hand, and so the risk is high with this system. Roulette is also a game of probability as the chances of getting a red or black are almost 50/50. As per the standard Martingale rule, if you lose a bet on a spin you should double your next bet amount, and so on. However, the Martingale system only works when the probability is exactly 50/50 so the player will have to limit their bets only to red and black to create an equal probability scenario in order for the system to work. For example, if you bet $15 on red in the first spin and lose it, you will then bet $30 in the next spin. If you still lose the bet, you will bet again, $60 this time. Once you manage to guess the right colour and win, all your losses will be recovered along with a winning payout of the same amount as your first lose bet. Remember that once you manage to win a bet through the Martingale system, you should start the sequence again from the original stake rather than continuing the previous sequence. As you can observe, the winning payout in this system is limited to your original stake amount, however, it also means that you have complete control over the amount you can win in these games. If you’re thinking that the Martingale system works every time and is a sure shot winning strategy at casinos, you are wrong. There are certain things that limit the accountability of this method, some of which are discussed below. The Martingale system works on the idea that you should keep betting (with double stakes) until you eventually win a hand. In practice, however, this is not possible unless, of course, you have a very large bankroll (and you’re ready to invest all of it). You cannot keep raising your stakes as you will eventually run out of money to bet, probably before you win a round. Most live and online casinos will only allow you to play till a certain limit (known as the maximum betting limit) on a game. The Martingale system can only work if you continue doubling your stake until you manage to win a round. It will fail if this basic rule is interrupted for any reason. The Martingale system can certainly help you win the game, but it is limited by many factors. Therefore, it is certainly not a recommended strategy if you are looking to earn big from casino gaming. Although it works well when used for small bets, it is definitely not a reliable long-term betting method.